While President Trump comes to Chattanooga tonight to lend his support to GOP Senate candidate Marsha Blackburn, the biggest boost for Blackburn this fall may have come from the U.S. Senate during the confirmation hearings on Supreme Court Justice Brett Kavanaugh in September, according to Tennessee Gov. Bill Haslam. Haslam, the outgoing two-term GOP governor who is chairman of the Republican Governor's Association, said in an interview on NBC's "Meet the Press" this morning that he thinks the controversy over the way allegations were raised against Judge Kavanaugh helped swing support toward Blackburn in her tight race against former Tennessee Gov. Phil Bredesen to succeed the outgoing U.S. Sen. Bob Corker. "Tennessee is one of those states where the Kavanaugh hearings did change things," Haslam said. "I don't know exactly, but I think the Kavanaugh hearings probably had a 5 or 6 point swing in Tennessee and I personally think that Marsha Blackburn will win by at least that much." Kavanaugh, who had previously been confirmed as a U.S. Circuit Court of Appeals 12 years ago, faced a new charge two months ago of sexually attacking Christine Blasey Ford, who is now a psychology professor at Palo Alto University, when she was in high school in suburban Washington more than 35 years ago. Kavanaugh denied the charges and Republicans criticized the decision to withhold "a vague, anonymous accusation for months" before releasing it on the eve of the Senate committee vote on the confirmation. In a speech today in Macon, Georgia, Trump said Democrats were "so horrible" in the way they handled the hearings of Kavanaugh, accusing Sen. Dianne Feinstein, D-California, of leaking Dr. Ford's allegations against Kavanaugh in an attempt to block his confirmation. Trump blasted one woman, Judy Munor-Leighton, who made allegations against Kavanaugh but has reportedly admitted she didn't tell the truth about knowing Kavanaugh in the past. U.S. Sen. Chuck Grassley, R-Iowa, chairman of the Senate Judiciary Committee, asked federal authorities on Friday to investigate Munro-Leighton's statements. Grassley said she initially took responsibility for authoring an anonymous "Jane Doe" letter that made allegations that Kavanaugh and a friend raped her. After she was tracked down and interviewed by Senate investigators, Grassley said, the woman purportedly recanted and said she had never met Kavanaugh and "just wanted to get attention." "It was a lie, a total lie," Trump said today as crowds in Macon shouted "lock her up.' "She made up the story and she was forced to admit it." Trump questioned whether other women, including Dr. Ford, may also have made up their charges. "What about the other women (who charged Kavanaugh with sexual abuse)?" Trump asked. Bredesen, who said during a Senate debate before the confirmation hearings that he wanted to know more about the nominee, said after the hearings that he would have voted for Kavanaugh if he were in the Senate because the allegations against Kavanaugh when he was in high school and a freshman in college "didn't rise to the level" of disqualifying him for the high court. Blackburn has consistently said she would vote to confirm Kavanaugh. Haslam said that has proven popular in Tennessee and he is confident the GOP nominee will win the closely watched Senate contest. 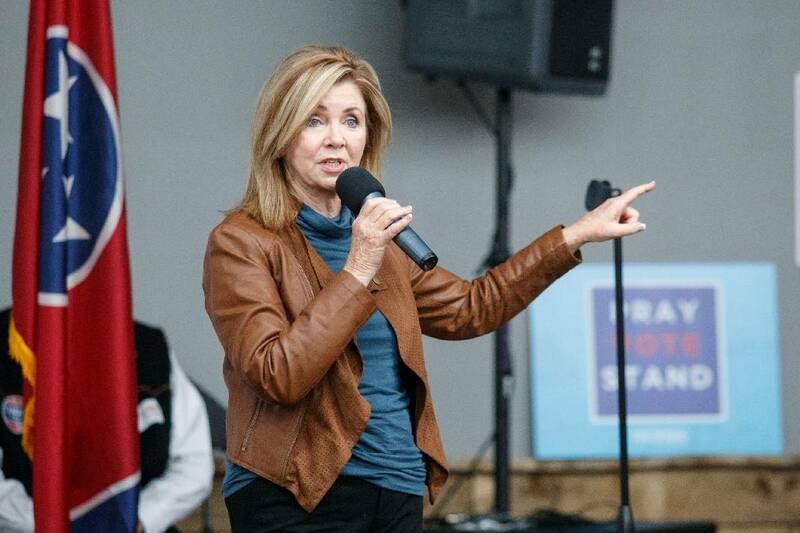 "Marsha Blackburn has run a really good race and I think she is well positioned," Haslam told NBC's Chuck Todd. Haslam told The New York Times that Bredesen's pragmatic approach to governing "has always been a good argument in Tennessee" and Haslam said today that Bredesen can "point back to a good term as governor." That has helped Democrat Bredesen, a former Nashville mayor and two-term Tennessee governor, to poll well in a state where President Trump won two years ago by a 26-point margin over Democrat Hillary Clinton. Bredesen is the last Democrat to win a statewide race in Tennessee when he won re-election as governor in 2006, but Republicans have continued to gain strength in most of the elections over the past decade. Haslam, who is heading the GOP national campaign to elect governors, conceded that with 26 of the 36 open governor races now held by Republicans, the GOP faces "an uphill battle" keeping as many governors in office, especially since presidents in their first term usually lost some offices for their party during the first mid-term election. "We have our work cut out for us," Haslam said. "That's why we have worked hard and raised a record amount of money in this election cycle and we're making sure we put all of that money to good use in the last three weeks of this campaign." Although gubernatorial gains Republicans made eight years ago in Great Lakes states like Wisconsin, Michigan and Illinois face tough challenges this year, Haslam said the GOP should maintain governorship in traditionally Democratic states in New England. 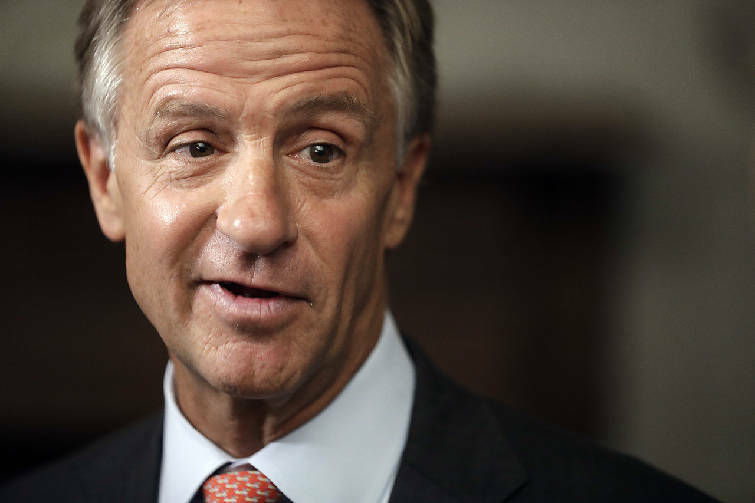 "We right now have Maine, Vermont, New Hampshire, Massachusetts and we have a really good chance to win in Connecticut (as Republican governors)," Haslam said. "I tell people all the time that surprisingly Bernie Sanders' governor (in Vermont) is a Republican (Phil Scott). "While the Senate races sometimes turn into the red jerseys versus the blue jerseys, the governor's races are different," Haslam said. "I think what you are seeing is that people look at the practical aspects of electing a governor. Who is going to attract jobs, produce the best schools and run our state's budget in a way that works. It's a lot different decision voting for your governor than it is for your senator." In Tennessee, while polls show a close Senate race between Blackburn and Bredesen, the Real Clear Politics average of recent polls show Republican gubernatorial candidate Bill Lee enjoys an average 13.8 point advantage over Democrat Karl Dean.